"But then, our eyes begin to work, and travel." 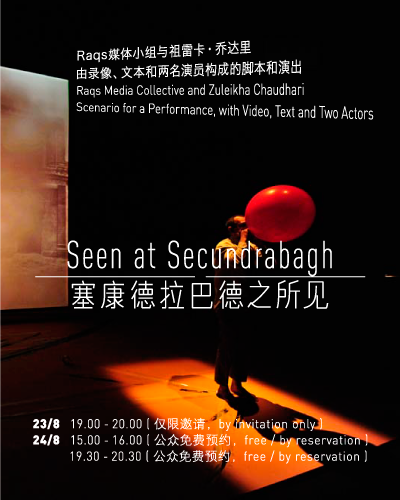 Seen at Secundrabagh is a collaboration between the artists Raqs Media Collective and the theatre director Zuleilkha Chaudhari, both based in Delhi, India. This fifty minute scripted performance featuring Kavya Murthy and Bhagwati Prasad unfolds against the projection of a photograph taken by Felice Beato in Lucknow, India in 1858 and within a scenario designed by Raqs and Chaudhari, with texts and video interventions by Raqs Media Collective. Felice Beato was a pioneering itinerant photographer who documented the Crimean War in Turkey, the 1857 Uprising in India and the Second Opium War in China. The photograph that comprises the central provocation of Seen at Secundrabagh features an improvised ossuary in front of a stately ruin (in the wake of the mutiny of 1857 in the army of the East India Company in northern India). Fixing a moment in India’s turbulent colonial history, the image appears to be a faithful representation of the facts. Seen at Secundrabagh slices into the stability of this impression with a series of poetic and forensic gestures that displace the power of the recorded image as it moves from the archive to the theatre. In the end, this demands from the spectator the desire to undertake a few forms of space and time travel, with the performers, Raqs and Chaudhari as trusted guides. The Raqs Media Collective (Jeebesh Bagchi, Monica Narula & Shuddhabrata Sengupta) are a contemporary art practice based in New Delhi. Their work takes the form of installations, video, photography, image-text collages, on- and off-line media objects, performances and encounters. They cross contemporary and media art practice with historical and philosophical speculation, research and theory. The Raqs collective have exhibited widely, including at Documenta 11, and the Venice, Istanbul, Sao Paulo, Taipei and Sydney Biennales. Works by Raqs Media Collective are part of several major contemporary art collections and museums, including the Thyssen-Bornemisza 21 Contemporary Art Collection, Vienna, the Shumita & Arani Bose Collection, New York, The Centre Pompidou, Paris, The Berger Collection, Moon Chu Collection, Hong Kong and Devi Art Foundation, Gurgaon. In 2007, they curated The Rest of Now in Bolzano/Bozen for the seventh edition of the Manifesta Biennial of Contemporary Art in Europe. In 2000, they co-founded the Sarai initiative (www.sarai.net) at the Centre for the Study of Developing Societies in Delhi. They are members of the editorial collective of the Sarai Reader Series.